Wisdom Sanctums for Lazy Bookworms and Others..
Last night, I was digging my old collection of rock CDs and I ended up listening to Creed’s Human Clay. Creed was a popular band in the late 1990s and early 2000s with three multi-platinum albums, grossing over 26 million records in the United States alone and an estimated 35 million records across the world. In spite of their massive success, they disbanded in 2004 but in early 2009, they regrouped and have released a new album ’Full Circle’ that I am yet to hear. Anyway, the term "overnight success" is an overused cliché, but in the case of Creed, that classification is spot on. 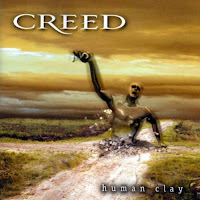 "Human Clay", the band's second offering, catapulted them to even greater heights, sending their sales to over 13-million units and Highs at the American Music awards. Their powerful live performances and ability to produce finger-on-the-pulse music created a loyal and growing following for this Florida-based foursome. In 1995, the original four musicians Scott Stapp, Mark Tremonti, Brain Marshall & Scott Phillips honed their skills by playing cover songs (a favourite was Radiohead’s "Creep"). In 1996, the band members used all their savings to put together enough songs for their debut album "My Own Prison" which was released in April 1997. They became the first band in history to have four number one rock/radio singles from a debut album. The album sold over five million albums. The first single from their already 9x Platinum album "Human Clay", "Higher", track number eight, broke the Active and Mainstream Rock airplay records for the most consecutive weeks at number one, holding the spot for eighteen weeks. Creed can best be described as a Metallica-meets-Counting-Crows outfit with a hint of Nirvana. The lyrics to "Higher" and practically every song on the album are awe-inspiring. "When dreaming, I’m guided through another world/ Time and time again/ At sunrise I fight to stay asleep/ Cause I don’t want to leave the comfort of this place/ Cause there’s a hunger, a longing to escape." The band's intensity comes through in songs like "Higher" with Stapp providing the lyrics and the band providing the complementing sound. The band's sixth number one hit came in the form of the very impressive down-toned "With Arms Wide Open" track number eight which stands out from the rest of the songs on this album. Its lyrics tell of a father welcoming his newborn son into the world and how scared he is of the task that lies ahead. "Well I don’t know if I’m ready/ To be the man I have to be/ I’ll take a breath, take her by my side/ We stand in awe, we’ve created life." Not enough fuss can be made about the lyrics of the songs that are written by Stapp and Tremonti. They have a unique ability to bring across everyday struggles and messages in a highly intense and soul-grabbing way. "Wash Away Those Tears", track number 10, is a lush ballad displaying the band's eagerness to explore different sonic territories. This album is a definite winner. Not only for the impressive guitar playing but also for the lyrics which tackle the rigours of the outside world. It’s not often that a band comes together with the ability to produce first-rate writing as well as supreme sounds. It came as no surprise to me when they were nominated for two Grammys: Best Rock Performance by a Duo or Group and Songwriter's Award for "With Arms Wide Open". so you are back to music finally..gimme more please. I must confess... I have never heard of them.